Three years ago, audiences were blown away by Rise of the Planet of the Apes, a smart reimagining of the Apes franchise for the biotech age. Now ape protagonist Caesar is back in Dawn of the Planet of the Apes, where humanity has been decimated by a plague and the planet's future is the grimmest you've ever seen. 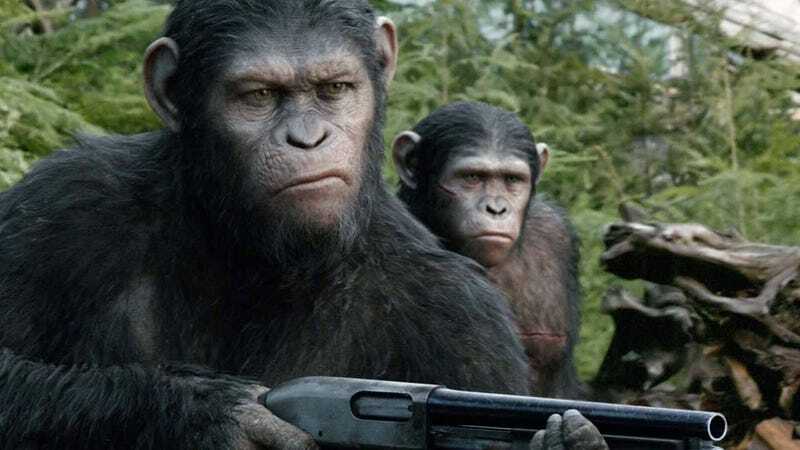 Most of the protagonists in the film are apes, and most of them communicate in sign language, so Dawn director Matt Reeves had to rely a lot on visual set pieces to drive the story forward. Thanks to the incredible skills of mocap master Andy Serkis as Caesar, this technique works. Ten years have passed since the great showdown between ape and human on the Golden Gate Bridge, and the apes have been creating a new society in Muir Woods across the Bay from San Francisco. Under their watchful eyes, the last lights in nearby cities go out — so many people have died in the plague that human civilization has fallen. As Caesar's human-hating lieutenant Koba says, good riddance. But Caesar still misses his human family sometimes, and he doesn't want his young son Blue Eyes to hate the people who made their genetically-engineered intelligence possible. There a lot of intense moments in this film that will stick with you for days afterward. When a group of humans enter Muir Woods, trying to start up an old hydroelectric dam, it's the apes' first hint that San Francisco isn't entirely empty after all. Blue Eyes and a young ape friend are nearly shot to death by one of the terrified humans (Fringe's Kirk Acevedo), and it's all that Caesar can do to prevent Koba from murdering the humans on the spot. Instead, he directs the apes to fill the trees around the humans, their faces covered in war paint and spears in some of their hands. "GO!" they shout, using the first spoken language we hear from them in the film. "GO!" We watch this scene from the vantage point of the apes, but then switch to the human perspective. Director Reeves manages to capture the terrified wonderment that these people are experiencing, after a decade of watching their own species die out, upon encountering a huge band of wrathful apes who speak English. The leader of that freaked out human band is Malcolm (Jason Clarke), and the movie draws a tight parallel between his struggles among the humans and Caesar's struggle among the apes. Both Malcolm and Caesar want peace between human and ape — and both are dealing with violent, charismatic counterparts who push for war. Malcolm founded a small community in the ruins of San Francisco's downtown area with Dreyfus (Gary Oldman), a former soldier who practically licks his lips when he talks about all the weapons that the now-dead military left behind. Meanwhile, Caesar is struggling with Koba, who was tortured by humans in a research facility and now wants nothing more than to treat them the way he was treated. Koba is horrifically believable, and his actions are even more disturbing because he has good reasons to hate the humans — while Dreyfus does little to dispel Koba's belief that we are nothing but a bunch of bloodthirsty ape killers. A large part of the film deals with the escalating tensions and violent conflicts between the apes and humans, and the war scenes are absolutely gut-wrenching. Though the apes never do anything that humans haven't done in battle, it seems far more awful when we realize that yet another species has fallen under the spell of warfare. You might think that Dawn is a dystopian story because of the Simian Flu plague, but it isn't. This is a war dystopia. It goes far beyond "war is hell" into something like "war is our genetic destiny as hominids." When the apes pick up machine guns as if it were the most natural thing in the world, it's like watching a condemnation of our species that's darker than anything The Road could ever deliver. Our penchant for war has infected another intelligent species, and the curse of humanity will live on even if we die out. Generally the film is superlative, but there are some clumsy edits and a few moments of extremely awkward dialogue that give Dawn a B-movie feeling once in a while. Malcolm's relationship with his son — who spends most of the movie reading indie comic Black Hole — feels tacked-on, as does his romance with an epidemiologist played by the criminally underused Keri Russell. Also, we never understand why a community of apes who were raised in high-tech city labs would start wearing feathers and warpaint. It makes sense that their village would be low-tech, since they've been avoiding the city. But why would they suddenly adopt a neolithic Indian style of dress, rather than the styles and cultures of the place where they were raised? There's a certain amount of lazy and irritating visual shorthand going on here, where we're supposed to understand that the apes are "primitive" because they live like tribal Indians (or maybe Africans?) did 500 years ago. This may sound like a nitpick, but when you see how much effort went into making the ape community seem realistic, it actually stands out as an obvious question. Still, the film's unevenness is ultimately overshadowed by its powerful representations of two communities decimated by war. Especially because we're left with the lingering sense that violence is written into our DNA, and we cannot evolve beyond it. This is rip-your-guts-out disturbing stuff, and at certain points you may cry. Go see this movie if you want to know what true dystopia feels like.